Cocaine, one of the many playable field items. Drug addiction is a popular sport which originated in America and has since grown into an international frenzy. It is considered by many to be America's real past time, as opposed to baseball. The game usually takes place in a stadium which is often referred to as the "ghetto", someone's basement, or a kids park. The game starts with the Addict and Pusherman on the playing field, trying to avoid being "arrested" by the cops (one of which may be undercover). From here, the game can take many different directions. The addicts goal is to use their chosen accessory, EI: Pipe, rolled up bill, straw, or needle, to trick every friend and family member, (excluding team-mates) into thinking they are average decent people till their faces are so grotesque, deformed, and ugly. The more horrific one looks before someone begins to question their health, and the more nonsensical they speak and act before someone questions their mental health, the more points the player receives. The Dealer's goal is to lie and manipulate the Addict into lying, stealing and cheating as much as they can in order to get their hands on more drugs. If the Dealer is good enough to convince the addict to get more people to join their team, the more points they receive. The Cop's goal is to intercept all plays made by the opposing team. Extra points are allocated for wrongful imprisonment, as well as for large busts that lead to money or drugs disappearing from the evidence locker. A bonus is also given for uncalled for actions leading to mortality on the opposite team. From here, two new players are called onto the field: the District Attorney and the Defence Attorney. After a long part of the game which is known as a "trial", the attorneys are substituted by the Rehab Counselor. From here, the Addict and Pusherman are released after a brief intervention with the Rehab Counselor. Then, the game starts all over again. During the second round, the attorneys are replaced by Bubba and Allah; the Addict and Pusherman are incarcerated. DMX is on the field the entire duration of the game. 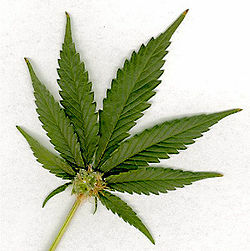 Marijuana, one of the many playable field items. Addict - the most important player in the game. Pusherman (or Dealer) - another important player; supplies the drugs. Cop(s) - usually on the offence, trying to stop and arrest the two above. Prosecution Attorney - also on the offence; attempts to put the Addict and Pusherman behind bars. Defence Attorney - usually on the defence, trying to help the Addict and Pusherman post-arrest. Rehab Counsellor - a liar. The Addiction Bowl is a TV show about drug addiction shown after Superbowl. Otherwise known as "420", the Addiction Bowl is one of the most widely watched sports programs, with addicts from all over the world tuning in viewing figures often exceeded those of the Superbowl and World Series combined. Typically, the game lasts all day and is hosted in many suburbs and ghettos across the world, particularly in the United States. The game starts with ditching school and/or work. During half-time, a bowl of Trix is usually eaten. The game ends with a ceremonial overdose where afterwards the families of the Addicts get to celebrate the success of their children's careers.